It’s an Imperial Airways Atalanta airplane (when did aeroplane go out of the vernacular?) at Mbeya, now Tanzania, then Tangyanika. Geoffrey was sent over there as Station Superintendent in the early part of 1937 when he was stationed at Nairobi, although he doesn’t list it in his ‘Postings’. I guess he was there between 1 and 3 months. His first task was to see to the rooms for passengers and crew, the second was to take the mail into Mbeya itself, on a truck. He’d never driven before! His account of this is funny, especially when it came to crossing a ravine on two planks. 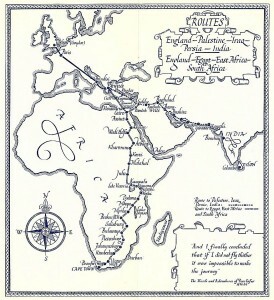 Mbeya was a night stop, which meant he had to arrange for the overnight accommodation, which was in a little ‘hotel’. He describes it in his memoirs; a verandah ran all the way round the inside, with rooms on either side, dining room and kitchen at the back, reception and lounges at the front. Mosquito netting was an important feature then, although mosquitoes do not seem to be an issue in Mbeya now. Geoffrey tells a number of amusing anecdotes about the behaviour of the passengers, and the business of accounting for their mess bills. 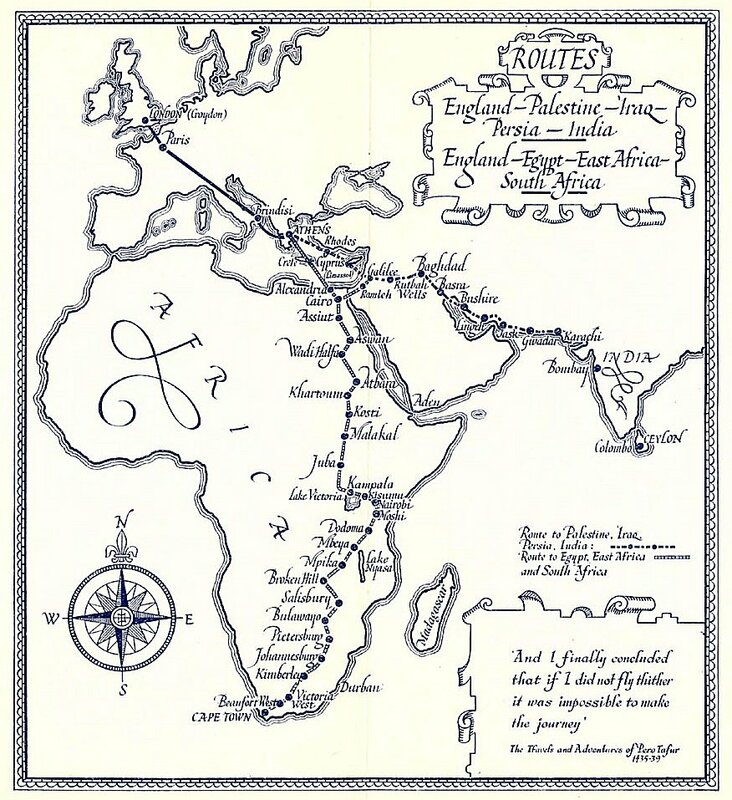 This was before the flying boat service started, and the route was that shown in the map below. You can click to enlarge it – Mbeya is just north of the long skinny lake (Lake Nyasa) which is parallel with the island of Madagascar. Pictures of the planes at Mbeya confuse me somewhat, since the one above is clearly taken at midday. The shadow of the plane is directly beneath the machine, so the sun is overhead – and when Geoffrey was there it would have been not too far from the spring equinox, so the sun really would have been over the Equator at midday (Mbeya is just under 9º S). I wonder what the local people are doing out there. Resting? Making sure that nothing happened to the plane? Just curious? I know Geoffrey had local workers who chased animals off the runway area (it was a dirt and grass runway) when planes were due to land or take off. I am sure there is someone on top of the wings in the middle, maybe checking something, or fixing it. There is no sign of a fuel truck, so it’s not being refuelled. There are mostly pictures of planes leaving at dawn, and since they wouldn’t have stopped more than overnight, I wonder this was a technical stop. There were four planes through a week, two in each direction, so I suppose it might have been routine on one of the schedules, but although I have a timetable for the flying boat service, I haven’t got it for this earlier route. 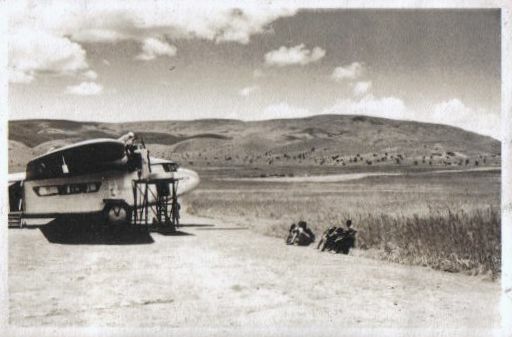 The flying boats came into service in July 1937, so I suppose Mbeya continued as a land plane base for anyone who needed it, and for planes from Nairobi to South Africa by people such as Wilson Airways. It’s easy for me to forget there was more to African flying than the flying boats. And in fact my correspondents on the old website tell me that this airport was used until the new airport at Songwe was opened, only a few years ago (Dec 2012). It looks like an interesting place to visit. Mbeya connects to the rest of Tanzania by air through Songwe Airport which was opened in December 2012, it is one of four major airports available in Tanzania. Auric Air and Fastjet flies Songwe to Dar es Salaam.